Looks like a muddy shoe, doesn't it? Only it's not. It's what a spontaneously delaminating Tecnica hiking boot looks like, and it's not a pretty sight...nor a pleasant experience when it happens while one is walking across a parking lot in a rainstorm. That's precisely what happened to Debbie yesterday. She wore these boots to the office because of the torrential rains (it was her day off so she wasn't particularly concerned about office dress code) and around noon she noticed that the toe of the sole was starting to let go. 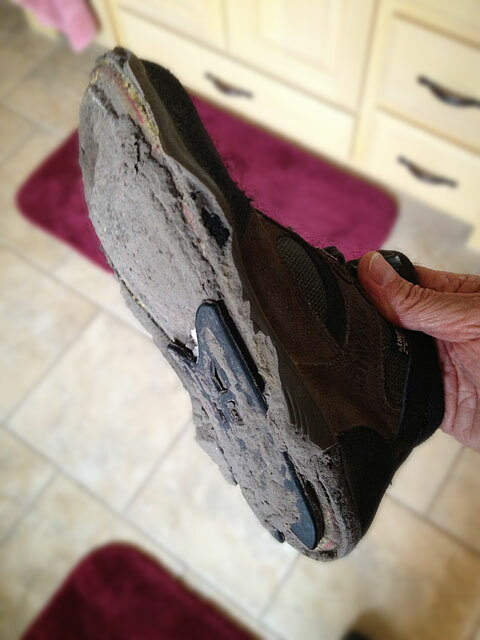 Within 30 minutes or so, the entire sole sloughed off. That mud-looking stuff (that's a widely accepted hiking boot term of art, by the way) is - I think - the adhesive foam used to affix the outer sole to the shoe. I've seen something similar to this before, when rubber products are stored in extremely hot temperatures for long periods, say, during a summer in West Texas. Rubber and related products simply disintegrate over time in such conditions. These boots were stored in a temperature-regulated closet, so that's not an explanation. Neither were they inexpensive shoes. They were, however, more than ten years old, so I assume the breakdown was age-related. This was nothing more than an interesting annoyance, but what if it had occurred six miles into a wilderness hike? I'm not sure what lesson is, other than don't expect your footwear to last forever, and once it gets to a certain age, inspect it closely before using it for any "critical applications." This page contains a single entry by Eric published on September 30, 2012 3:15 PM. Two Things was the previous entry in this blog. Two Things: HaloRig / Flyboard is the next entry in this blog.